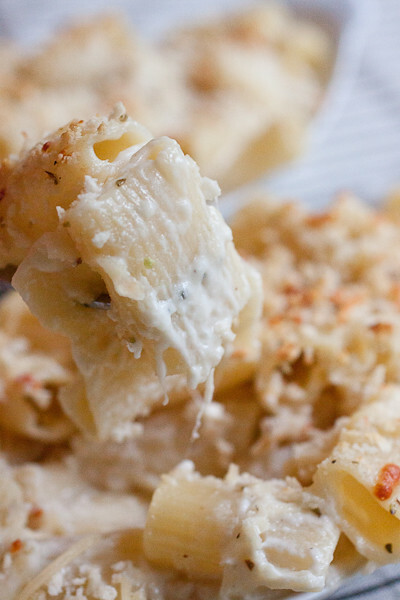 Creamy Baked Four-Cheese Pasta: This is a sophisticated mac and cheese recipe that turns a simple cheese sauce into a spectacular meal with just the use of a screaming hot oven. Even in the midst of summer, with the grill roaring and endless amounts of ice cream cones happening, there is nothing I love more than cozying up in a pair of sweats on a rainy and chilly day. I’m talking the type of day where the feel of fabric on your legs feels amazing and fall feels just around the corner. You know those types of days! And considering I’m probably rushing things, since summer just officially started last week, I can’t help but look forward to those days. I first became aware of this feeling when I was 10 or 11 years old in the middle of a blazing hot August. I ended up hanging out on the boat with my mom while she did some cleaning and organizing inside the tiny cabin on a super crummy day. Too rainy and chilly for even sitting on the dock looking for crabs hanging on to the submerged bulkhead, I threw on a pair of sweats and nestled into my book (likely The Baby-Sitters Club – the original ones of course since we’re talking late 80s/early 90s here – or Anne of Green Gables). That kind of day calls for this kind of food. 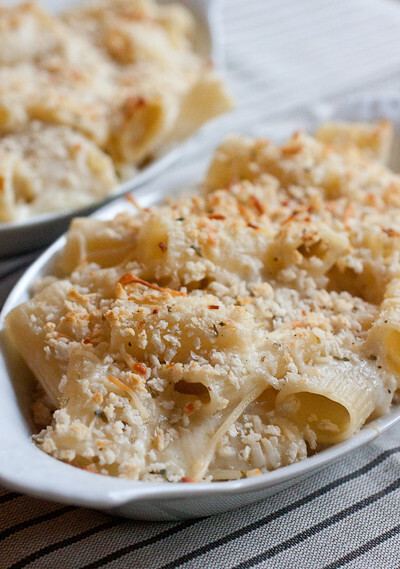 And this creamy baked four cheese pasta is what I’m talking about here! My one-pot creamy sausage pasta would also be excellent on days like this but let’s focus on this recipe for now, shall we? It’s a crazy simple dish that requires almost no work at all but it will have you singing with delight. Strong-flavored Italian cheeses make up the components that get heated by and mixed in with the hot pasta. Then, a quick butter-flour-milk sauce (a basic bechemel) gets poured over the top and stirred in. You’ll bake everything at a high heat for just a few minutes then serve up a cheesy and sophisticated mac and cheese that will instantly make you forget about whether its a crummy summer day or a cold winter night outside. It’s the kind of cheesy pasta dish that’s just perfect either way! There’s a lot of cheese to grate and crumble here so to cut down on the prep time on the night I planned to to make this recipe, I grated and crumbled the cheeses a day in advance and kept them in a resealable container in the fridge. This quick step did wonders for speeding up a weeknight meal. Adjust an oven rack to the middle position. Preheat the oven to 500° F.
In a medium bowl, stir the bread crumbs, Parmesan, oregano, salt and pepper together; set aside. Add all of the cheese for the pasta to the bottom of a very large bowl; set aside. Cook the pasta in salted boiling water for 2 minutes under the recommended cooking time. While the pasta cooks, in a small saucepan set over medium-low heat, melt the the butter. Whisk in the flour and cook, whisking around, for 30 seconds. Slowly pour in the cream or half-and-half while whisking until no lumps of flour remain. Bring the heat up to medium and stir until the mixture starts to bubble and thicken; simmer for 1 minute. Stir in the salt and pepper. Drain the pasta for 5 seconds, pour it over the cheese in the bowl, then pour the sauce directly over the pasta – do not stir it in. Immediately cover the bowl tightly with plastic wrap and allow it to stand for 3 minutes. Remove the plastic wrap and stir all of the ingredients up, taking care to scoop up all of the cheese from the bottom of the bowl. Once the cheese has melted and is incorporated with the sauce, transfer the pasta to a 13×9-inch baking dish or a few smaller baking dishes. Sprinkle the breadcrumbs evenly over the pasta, pressing down lightly. Bake for 5 for smaller dishes or 7 minutes for the larger dish, until the top is golden brown. Allow the dish to rest for 5 minutes before serving. 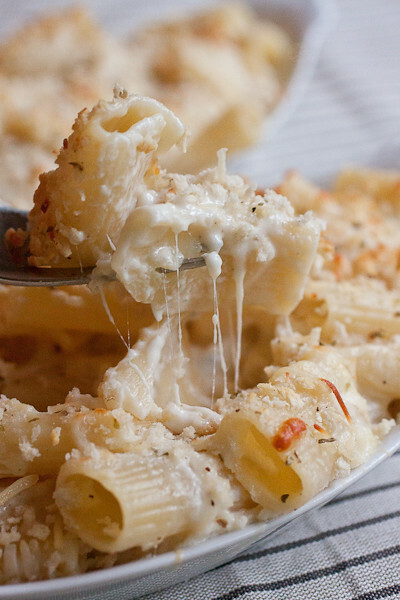 Gotta love a good, cheesy, pasta!! Yum! I love pasta, and with four cheese that can’t be anything but perfect! While I can’t agree with you about loving cooler weather, I will say how much I luhuuuve this pasta, omg cheeeeesy goooooodness! Oh my goodness, I can’t believe how good this looks. I’ve wanted to try this recipe for so long, and damn girl…this really didn’t help. Looks incredible!